team hypercube Archives - Hello, Kristina! Video Roundup: Nearly Christmas Break! Hey everyone! I have really been meaning to write up my second bucket list post (which highlights my recent trip to the Winchester Mystery House)… but I’ve been both sick and distracted with the Project 4 Awesome, so it hasn’t happened yet. I have posted a lot of videos recently, however, so I thought I would tide us all over with a round-up post of all of those in the meantime. We’re also getting dangerously close to WEEK 100 on Dokapon Kingdom, so you might want to catch up so you don’t miss it! Check out Team Hypercube and subscribe, because more things are going to be happening there in the new year. You’ll want to keep an eye on it. Coming soon on this blog will be my bucket list post, reviews of the two most recent ipsy bags, and a lot of fun outfit of the day posts for the holiday plans I have on the horizon. Thanks for sticking with me and I’ll be back again soon. In the mean time, let me know in the comments who your favorite Adventure Time character is and which one you’d want to play in the new WiiU game! This weekend was a crazy one. I spent most of Thursday and Friday sleeping and drinking water furiously in hopes of getting better in time for Extra Life, the 25 hour gaming marathon meant to raise money for the Children’s Miracle Network. I mentioned this on here before, but my team (Geekyhostess, Satire and the rest of Team Hypercube) host a 25 hour live show so folks can interact with us while we attempt to play games straight for all that time. I am now happy to report that we’ve done it for two years in a row, though I personally struggled a bit more than the rest of them. We agreed that I should come a few hours late, so I didn’t start the day off poorly. While my lovely team began gaming at 8am on Saturday, I took my time, took some medicine, and waltzed in around 10:30. But then I was great! My nose was significantly less stuffy, my head felt less explodey and I managed to take part in a surprising number of games. I started feeling woozy again around 10pm, but to be perfectly honest – making it 12 hours on the upswing of a cold was largely impressive. During the time that I was on, some highlights included: playing King of Tokyo, testing out the Job Hunters RPG, Cash and Guns, You Don’t Know Jack, and of course, Babycam. I also quite enjoyed scary game hour, and listening to the rest of the team making their silly themed Magic the Gathering decks. It’s a bummer that I was sick, but we had a LOT of fun doing Extra Life anyway. Everyone in the chat was incredibly supportive and great, we got to try a lot of new games, and we managed to double our goal — hitting $2,000 raised by 6am! Thank you to everyone who stopped by the live stream, and furthermore THANK YOU to the amazing people who donated. You can still donate here if you missed it and want to help out. Now it’s time to catch up on NaNoWriMo after the craziness of Extra Life is over. 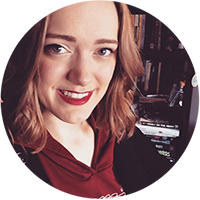 Be sure to follow me on twitter for word sprints this month! I don’t know what the exact date is, but Justin informed me recently that we’re at approximately our one year Team Hypercube birthday. So… happy approximate birthday, gaming channel! I promise when I actually have kids someday, I will pay much more attention to these types of details. In the year that we’ve been posting to this channel, we’ve made 284 videos. 85 episodes of Dokapon Kingdom. We’ve played 23 games, gained over 6,000 followers and hosted multiple live shows. It’s been an awesome ride and I will be the first to say that I’m extremely excited to see where the next year takes us with this project. Sometimes I find it crazy how much effort we’ve all put into this little project, how much it has taken off, and most importantly – how awesomely dedicated our fan base is. I adore this channel and I look forward to even more people joining in the fun in the future. Thanks for watching for the past year! 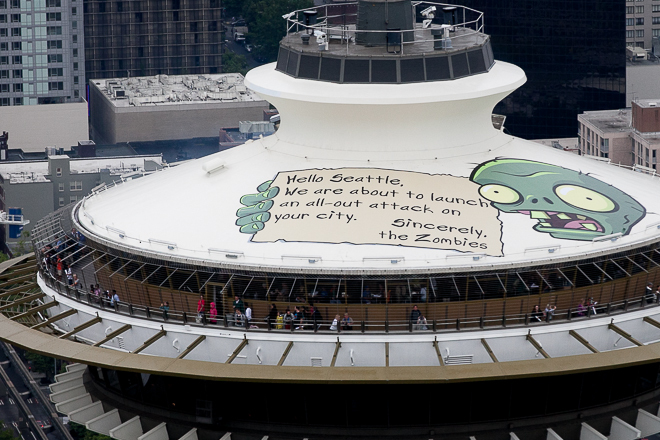 Plants vs. Zombies 2 Takes Over Seattle! Many have said in the past that the Space Needle looks more like a space craft than any sort of human building, and for this short time – they were right! The zombies have left their warning for our poor city, and now all we have left to do is fight back. And fight back we will! In fact, I started playing Plants vs. Zombies 2 around the time this Space Needle stunt happened, and decided to film the experience for use on my game channel, Team Hypercube. I’m embedding the first video below if you’re interested, and be sure to subscribe to the channel if you want regular updates when new videos go up. This is one of my favorite new publicity stunts to date. What sort of interesting marketing have you seen in the past that compares to this? Let me know in the comments! 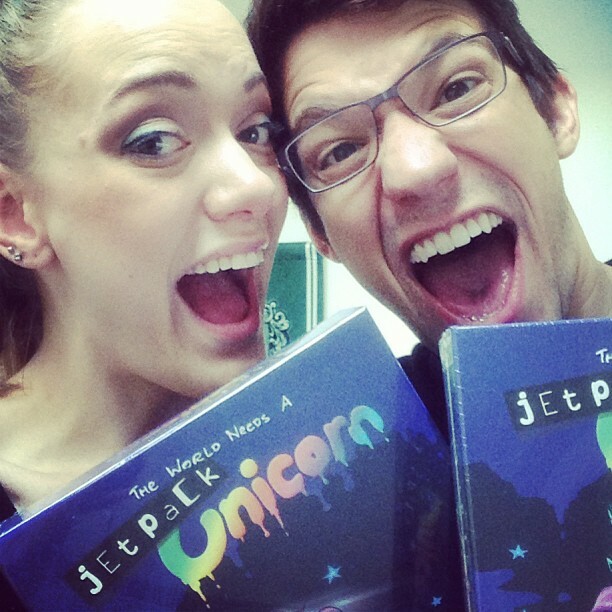 About a week ago, Joe and I got a package in the mail containing the first two boxes of Jetpack Unicorn. I’m sure you can imagine our excitement, holding the game we created in our hands for the first time ever. It’s a surreal experience, as I’m sure any creator knows – to work tirelessly on a project and then, suddenly, the finished product just… exists. It’s hard to accept that it’s a wholly real and tangible object you can touch and open and eventually sell to other people who will hopefully in turn love and enjoy it as much as you hoped they would. We took the game up to AFK Tavern, our favorite nerd bar, and we filmed ourselves opening the box. I mean, come on – you can only open the first game you create once in your entire life, so I felt the moment needed to be saved. We went on to play (with real cards!) with a handful of our friends amidst ordering drinks like the Sonic Rainboom and the Still a Better Love Story Than Twilight, and overall the night rated pretty high on my list of favorite nights. If you’re interested in see our unboxing, I’m embedding the video below. Also, Jetpack Unicorn will be available in stores and on DFTBA.com very soon! I will keep you all informed.